Sitting at my desk in what I call my “semi air-conditioned” office in New York City’s theater district, I look out the window at cars, trucks, buses, and brightly colored bicycles all moving purposefully, at the same pace, in the same direction. I reflect on my past month in India. I recall a similar street scene of brightly colored trucks with the word “honk” painted artfully on their bumpers (if they had them). These trucks moved alongside cars, tuk tuks, buses, bicycles, people, cows, goats, and buffalo, all on cell phones (except the animals), moving on narrow one-lane, unfinished streets in opposite directions, following no lights, no lines, no rules, just loud honks and yelling. I quickly came to understand why everyone prays in India! Perhaps it is through their prayers and strong sense of family and community that the people of India are able to sustain amongst the surrounding chaos and develop strong, resilient children. I have traveled to India for the past four years to teach social and emotional skills. I have taught in various places from high-end boarding schools to some of the poorest government schools. I am also able to visit with families sponsored through a non-profit I work with that provides on-the-ground support and financial assistance to local families in need. One such family includes Priya, a very special young girl from Varanasi, one of the spiritual centers of the world. I personally sponsor Priya so that she may attend an English speaking school to ensure she can secure future employment. But my interaction with Priya is much more than sponsorship. We have developed a lasting and meaningful relationship that has brought me joy and changed both our lives in ways I never dreamed. Each year I look forward to my time in India and the lessons I learn there. This year particularly, I returned home with memories filled with a myriad of experiences: harrowing and peaceful and spiritual. I believe each of them will impact my work moving forward. Thinking over some of my most meaningful experiences, I find a new energy, calm, and focus with which to enter the upcoming ENACT school year – Year 28! Don’t smile at monkeys! Yes, I was bitten by a monkey. The attack came at the Hanuman Temple in Varanasi after I smiled widely at a cute monkey infant clinging to a tree. The infant’s mother promptly reciprocated my interaction by jumping out, chasing me down, and biting me. In reflection, I can’t blame the mother; she was protecting her kin as any good mother would. She feared that her baby was in danger and responded in the best way she knew how. It reminded me that we all have primitive instincts to protect ourselves and the ones we love. It also reminded me that intent is not always the same as impact. I was innocently trying to make a connection with the infant, but even our best attempts can sometimes be initially rejected. “I see the divine in you” I was at a yoga ashram in tropical Kerala, entering the evening chanting session. As I took off my sandals to enter the room, I asked a beautiful Indian woman dressed in a flowing orange-red sari, what the mark on her forehead meant. She explained that for some women in India it signifies their marital status, but in general the mark placed on the forehead means “I am divine and I see the divine within you”. This statement brought an instant feeling of connection and calmness to me. It reassured me that I was being seen by this stranger as the best or highest part of myself and immediately removed any fear of judgment around my personality, ethnicity, or age. I felt a sense of universal connection. In retrospect, this interaction made me think about the students I work with in New York City. Many of our students define themselves as “bad” because this is how they are labeled by others. They in turn play out the role of “bad kid” for their peers and authority figures which leads to conflict and often to aggressive behavior. It always breaks my heart because, of course, they are so much more than this definition. Indeed, just like the monkey above, the majority of our kids are defensive when they first meet us; they are ready to be judged because they have learned that they usually will be. Once they see that we accept them for who they are without judgment, a sense of trust develops. They understand that our intent is to bring them into our group and they begin to open up so that meaningful work can take place. I pose this question: How can we as practitioners look at our students and see that they are more than the defensive mask or role they display? How can we read deeper into their hearts and see that they are also “divine”? They are unique individuals born with dignity, and they have the right to be seen as such. Often without proper tools, they are just trying their best to find their better selves as they wade through the challenges of adolescence. More often than not, when they are reminded of their dignity and worth, the students are able to step into positive roles and live up to the strength-based expectations we have of them. In effect, aren’t they just a mirror to us, to our humanity? Can we embrace the belief that they are not their behaviors? They are not their often volatile or shut down expressions. They are divine individuals with the same potential for actualization as we all are. Wouldn’t the world be a better place if we could all hold this belief? The power of community. To be completely honest, when I enter the back alleys and overcrowded buildings that house some of the most poverty stricken residents of India, I am initially horrified. When I am taken to these places by my Indian guides, the first word that pops into my Western mind is slums: residential areas where dwellings are unfit for human habitation due to dilapidation, overcrowding, lack of ventilation, light or sanitation facilities. I am struck by the dirt; the foul smelling sewage running through the walkways; the annoying, possibly malarial mosquitoes; and the tiny rooms, only the size of walk in closets, but housing eight family members who live together, sleeping on floors or wooden platforms. No water, one meager light bulb, and always an altar for daily prayer. Once I cross the threshold from the alley, I am however, always taken aback by how brightly painted the interiors are with hues of blue and purple. I am also impressed by how impeccably clean and organized the houses are inside. As I am asked to remove my shoes, I am greeted with a prayer by the mothers, always dressed in beautiful saris, often with heads half covered, cooking over a propane stove on the floor. They prepare chapattis (flatbread) for me as I ask about how their children are doing in school. They are humble and gracious. The children are present, always with big smiles, polite and engaged. What I first judge as a desperate situation of poverty, I then see as, and am moved by, the love, the family closeness, and communal support they offer each other. Their overcrowded neighborhoods become tightly knit families of aunties, uncles, and cousins who are always there for support and guidance. I am almost envious in some ways compared to our New York lives. Here in New York City, many of my friends live alone or our families are spread all over the country. We have a grand sense of independence, but seeing the power of community support in India, I wonder what we may be losing in exchange for our sense of individuality and independence. I have repeatedly seen many of the New York City children I work with at ENACT live in low-income housing with a single parent, multiple siblings, and in some cases, just like in India, all sharing a tiny space. But these same “put-at-risk” children don’t always have the feeling of emotional protection and safety that I see in many Indian families. I believe they do not have the same extended family and community support that glues together the families in India. In my work, our students say they feel isolated and afraid. They often don’t feel safe even walking to school because of the violence and gang presence that surround their homes. Some may even join gangs for the feeling of protection and family it offers. These kids deeply desire the same support and community I see lovingly expressed in some of the poorest neighborhoods in India. That is not to romanticize the conditions in these poverty stricken areas, but it has me thinking about the similarities and differences between my U.S. and Indian students. In India, the struggles of poverty can be insurmountable, yet in many families the sense of community and spiritual rituals that feed the soul seem to be a comfort unlike what I see in the United States. 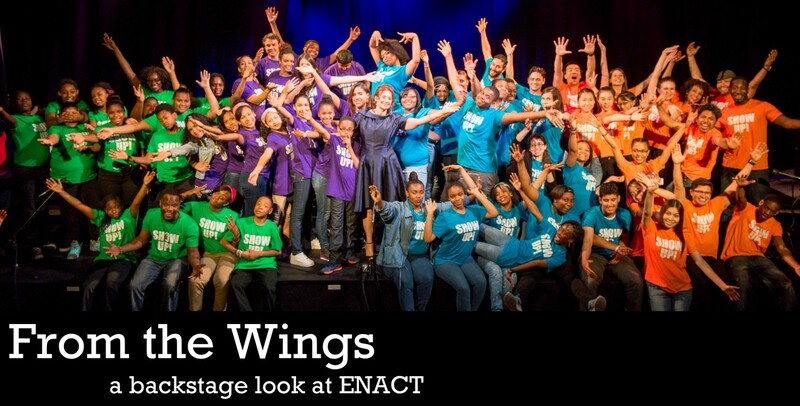 For years, ENACT has aimed to create a sense of family in the classroom through regular routines and consistent positive regard. By using the rituals of theatre and play, we are creating our own communal space where support is engendered and everyone is perceived as their best selves. When I visit India, I am always asked to bring a part of the United States with me and teach our Western ways. But, I realized very clearly during this trip, that there is much for me to take home and share with our U.S. students, our staff, and our Teaching Artists about what I learned in India. And even more so, there are numerous parallels that remind me that struggle, resiliency, pain, and hope are universal human experiences. They may be packaged differently, but these experiences are present both close to home and in faraway lands. As I return to my ENACT work this year, I feel even more committed to continue to create communities of belonging in our classroom spaces. I am also committed to joining other non-profit partners to help create a village for our students so we stop blaming them for reacting to untenable experiences and conditions. As a calmer, more focused leader, after my travels abroad, I move into the next year with ENACT with passionate enthusiasm and memories of lessons learned in India to bring to the classroom! OM!!! Diana Feldman is a Registered Drama Therapist and Licensed Creative Arts Therapist. With almost 30 years of experience using drama therapy in public schools, she is the Founder and CEO of ENACT, Inc.; author of several articles outlining her specific method of work; and frequent presenter at drama therapy, trauma-informed, and mental health conferences around the world.